The Brown Thrasher is an actor, not robed in distinguished gray like the catbird or the mockingbird but in ruddy. 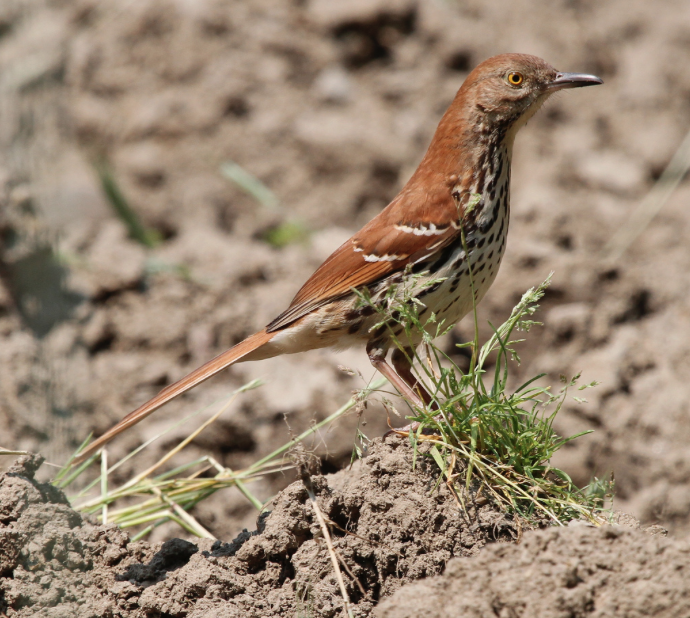 As noted in Chris Leahy’s information packed and engaging resource, “The Birdwatchers’ Companion”, the Brown Thrasher doesn’t beat or thrash with its long tail and doesn’t thresh with its long, curved blade of a bill. The bill allows it to forage deep in thickets and last season’s leaf litter by sweeping the detrus and soil away and then pecking, probing and seeking insects, snails, toads, frogs, seed, beetles, fruits and nuts. I watch them intently as they pass in jerky flight along the vegetated edges roadside and take cover. The rufous hue makes them difficult to see undercover. I smile when I hear their smack call which I liken to a loud kiss ~ that “tcheh” call note of this rufous mimic. I regularly focus on Brown Thrashers while they cross low over the road at Parker River National Wildlife Refuge. My concern for them heightens on the hot days of summer when the beach-goers stream to the Refuge’s and Sandy Point beaches. I’ve studied them for hours asthey fly in and out of the shadbush, serviceberry, shadblow and beach plum thickets at this important and renowned birding area. They appear unsettled and uncomfortable in the open; they’re in their element when undercover. The Brown Thrasher has a slender bill, and the lower mandible has yellow at the base. Its face is gray; its eyes are yellow. Those white wing bars and yellow legs are easy to discern and focus on. Its tail is long, rounded and keel-like. It’s known as a large, boldly patterned, long-tailed skulker that loves the thickets. Both sexes are rich, bright rufous with buff to white underparts with black streaking. The Brown Thrashers are conspicuous due to their large size [9-12 inches]. With a wingspan of 11-13 inches, they are seen well as they dart low, barely undulating, in front of my car. I’ve invested the time this summer to watch them dust bathe roadside while I’m enroute to Sandy Pointwith my windows closed of course as there’s been little rain this spring. By the second or third week in April, the males arrive. Once on territory, the vain male will perch high vertically and announce the season. The male is on territory ahead of the female, and often his song is delayed for a few days. When the female arrives, the song of doubleness begins. Once a mate is secured, the pair limit their movements and begin nestbuilding. The mated male sings a softer song. The female shapes the nest, and both male and female bring in the nest construction supplies ~ twigs, grapevine, rootlets, grass and dry leaves. Theest is a hefty, dense parfait with many tiers ~ often four ~ first twigs, then dry leaves, grapevine and paper compose the second tier; the third tier is stems, twig roots with soil, and the fourth tier is rootlets without any dirt attached. I’ve watched them beat the roots on the hot, black pavement and shake them to remove the dirt. The nest’s outside diameter measures 12 inches; the inside diameter is 3 – 4 inches; the inside depth is 1 inch. The nestlings are helpless with downy tufts; they fledge between 10 to 14 days, earlier than Gray Catbirds and Northern Mockingbirds. The male has charge of the fledlings, affording the female the opportunity to produce 2 – 3 clutches. If there isn’t a second or third brood, the pair divide the care of the fledgings, sometimes moving the young to separate areas.